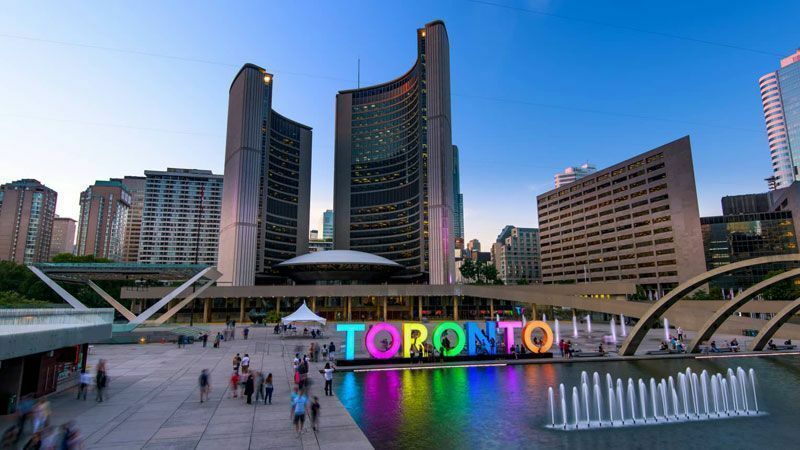 Tourism Toronto, its meetings, conferences and events unit Business Events Toronto, and tourism partners are celebrating Global Meetings Industry Day (GMID) on April 4, 2019. The celebration comes on the heels of a record-breaking 2018 for business events that included 26 citywide conventions, 500,200 delegates and an economic impact of $565 million generated for the Toronto regional economy. GMID is an international day led by the industry advocacy coalition Meetings Mean Business and Meetings Mean Business Canada that showcases the value that business meetings, conferences, conventions, incentive travel, trade shows and exhibitions bring to businesses and the economy. In celebration of GMID, two of Toronto’s most iconic landmarks – the CN Tower and the 3D TORONTO Sign – are turning blue, the globally recognized colour for the day. In addition, the Princes’ Gate and the four entrance towers to Enercare Centre at Exhibition Place, along with South Building at the Metro Toronto Convention Centre will light blue on April 4. Toronto has a significant opportunity to showcase itself as a destination for the growing conferences and events industry when the city hosts Meeting Professionals International’s (MPI) World Education Congress. This signature event brings together meeting professionals from around the globe at the Metro Toronto Convention Centre from June 15-18, 2019. The recently launched Global Economic Impact Study, conducted by Oxford Economics on behalf of Events Industry Council, ranked countries based on direct economic impact by the business events sector, with Canada ranking 6th amongst the top 50 countries. The Global Economic Impact Study cites that business events in 2017 generated more than $1 trillion of direct spending globally, over 10 million direct jobs and $621 billion of direct GDP. The strength and opportunities found within the Canadian tourism industry were recently highlighted in the Federal Budget, which recognized tourism as an economic engine for the country. The 2019 Federal Budget added tourism as the seventh “Economic Strategy Table” – a model for industry-government collaboration, focused on turning Canadian economic strengths into global advantages. Following a record-breaking 2018, Toronto is set to welcome a number of high profile events in 2019. In addition to MPI’s World Education Congress, North America’s fastest growing tech conference will be in North America’s fastest growing tech region when Collision heads to Toronto. The conference will be in Toronto for three consecutive years – 2019, 2020 and 2021. Collision builds on the region’s momentum as a hub for technology and innovation while leveraging the strength of Ontario and Canada as diverse and inclusive. 25,000 estimated delegates are expected for Collision which takes place from May 20-23, 2019 at the Enercare Centre. In addition, this July, 45,000 delegates will also be in Toronto for the JW International Convention, taking place at the Enercare Centre July 19-21, 2019.